which seems consistent with the report at EMT. FUL has the advantage of an observer at this point vs the automated report at EMT [I’ve learned to mistrust the cloud sensor at EMT], but is closer to the ocean and does burn off later than EMT. 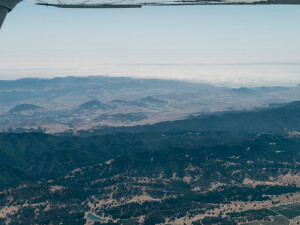 As we still could not see the mountains to the north, we decided that an IFR departure to VFR on top would be the safest solution and an excellent chance for a some actual IMC experience. We started the plane and called ground for a clearance to VFR on top. 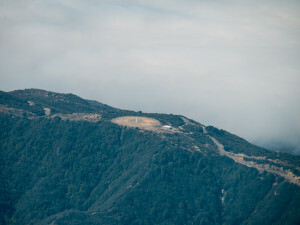 A clearance to VFR on top is usually given to a VOR or intersection. In our case, we were cleared to the Paradise VOR (PDZ) and told to climb to 4000. Getting the clearance and waiting for the release added a few minutes, so we were wheels up at 845. One downside to the IFR departure at EMT is that it requires departing east, even when you want to head west. At about 1700′ MSL we entered the clouds. Less than two minutes later, we broke out into bright sunshine at 2300′. Pilots sometime make the mistake of canceling IFR the minute they are above the clouds – don’t, you aren’t VFR in most cases until you are 1000′ above the cloud tops. At 3500′, we cancelled IFR and turned back to the west. We had gone about 5 east of EMT and were now back on course, heading in the direction of the San Marcos VOR (RZS). 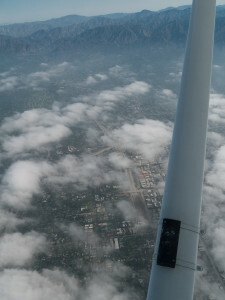 As we moved west of EMT, we could see the clouds were breaking up quickly over Pasadena. We flew over the boundary between clearing and clouds. The northern sections of the LA Basin were clear. When flying VFR, I recommend you avoid overflying a solid undercast if at all possible. 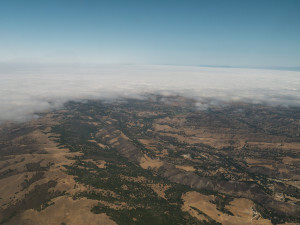 As we approached RZS, the clouds were covering the coastal plain, but the inland valleys (Santa Ynez) were clear. We cruised at 6500 and were consistently making ground speeds right in the 110-120kt range. Turning the corner towards Santa Maria, we moved more inland to avoid the clouds covering Santa Maria. As we approached Paso Robles and the southern end of the Salinas valley, we left the clouds behind for a while. We stayed east of the 101 to avoid the restricted area northwest of PRB (though we were advised it was cold and could have gone through). As we moved further north, we were able to see clouds at the north end of the Salinas Valley. We asked Oakland Center if we cou’d either go off frequency to get current MRY weather, or if he was able to provide it. The center controller gave us weather indicating low enough IFR to require the ILS approach. We decided to wait until we were with NorCal approach to get IFR clearance (about 20 miles from MRY). They vectored us south of the ILS course for the ILS 10R, descending us as we cleared terrain, but waiting on final clearance until we were almost on the course. About 2 minutes through clouds, we break out right on the approach course lined up with 10R. First instrument approach for a student pilot! We land and taxi to the Monterey Jet Center, park [know the marshal signals], and shut down around 1130. 2:45 en route was right on estimate with adding the extra distance for both the IFR departure and approach. 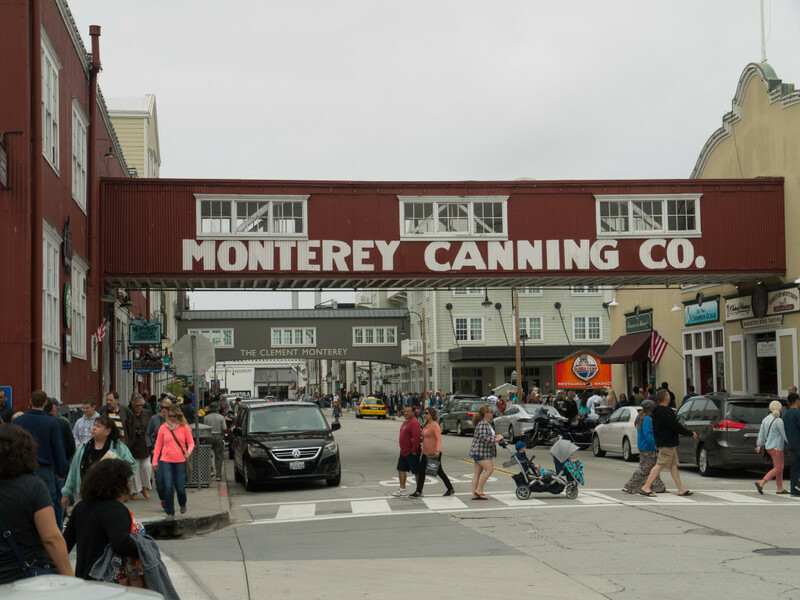 A few minutes later, we were on our way with a crew car towards Cannery Row for lunch. The ceiling was really just right over the airport, high enough to depart and quickly broke up to the east. We asked for a VFR left downwind departure and climbed up and over a ridge and along the Carmel valley to our cruising altitude of 7500′. Our route back was very similar, though we were able to stay closer to the coast, as the clouds had begun to clear (though unfortunately, not around Monterey, so we were unable to do a route back over Pebble Beach and along Big Sur). In cruise, we had time to cover a few topics, like the use of our Garmin 530W GPS lesser used features such as nearest airport, ETE/ETA, TAS/Winds calculation, and modifying flight plans. Given what we could(n’t) see, we asked for the VOR approach into SMO. SoCal had us climb to 3500 and fly to DARTS (an intersection near BUR). 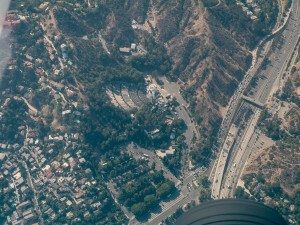 This took us right towards the Hollywood sign, but we were soon vectored onto the final approach course and cleared for the approach. 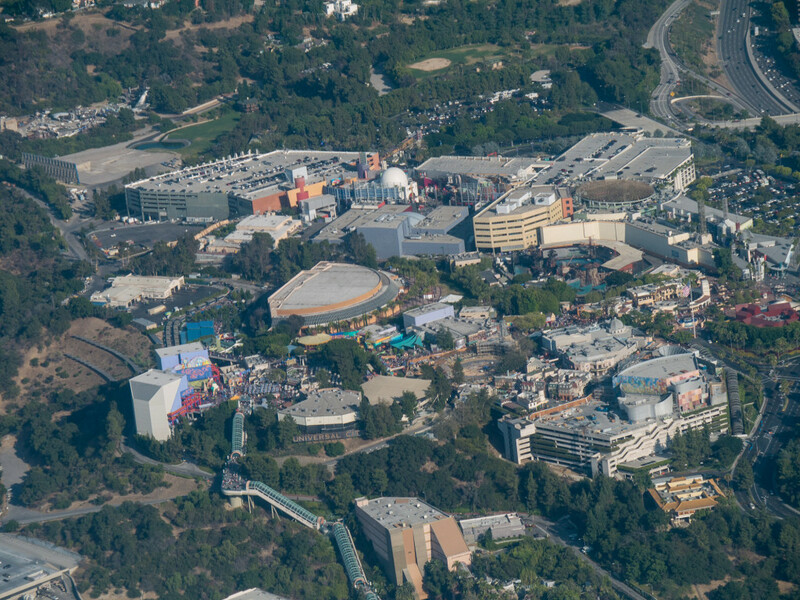 We nicked the corner of the clouds right around the CULVE waypoint, which helped show why the DME step down is right there, having just passed the towers of Century City. 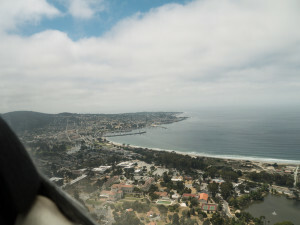 We landed, parked, bid adieu to the friend we picked up in Monterey and were again on our way for our home base of EMT.We requested a clearance to VFR on top. The routing included mostly vectoring to an intersection northwest of SMO. The one hitch was waiting about 15 minutes at the runway to be released for departure. We watched several jets arrive and depart and saw a few planes push the definition of VFR flying. After departure we broke out of the clouds quickly (a very thin layer), cancelled IFR a few minutes later and were on our way to El Monte, flying north of the Hollywood sign and Universal City. So, what else would be helpful to know about the flight? Ask some questions in the comments here or on Facebook and I’ll do my best to answer them and edit the entry to be more useful. This entry was posted in Destinations, FLIT, Trip reports by dgwerntz. Bookmark the permalink. – Your T-1 post suggested modifications to stay VFR. Did your actual flight indicate that those changes would’ve worked out, e.g., leaving KEMT later, using KSNS as an alternate? – Your route looks like a good mix of safety, scenery, and ease of navigation. Did you consider going via Gorman and then direct, or is there not much difference in the end? A VFR departure would have required a little delay, but not much. The challenge would have been departing with both MRY and SNS IFR and counting on them going VFR. That means you are hoping the forecast is right, so I would have had a more guaranteed ‘out’ – maybe PRB? SNS went VFR later in the day, but overall, the trip there and back could have been made VFR with changes in timing (remember that we actually departed MYF VFR on the way back). As far as going over GMN, you could do that, but you’d need to climb higher and have fewer airports along the way. After Gorman, there would be many flat areas for landing options, but I find the route less interesting. It would reduce the need to fly near clouds in most cases.